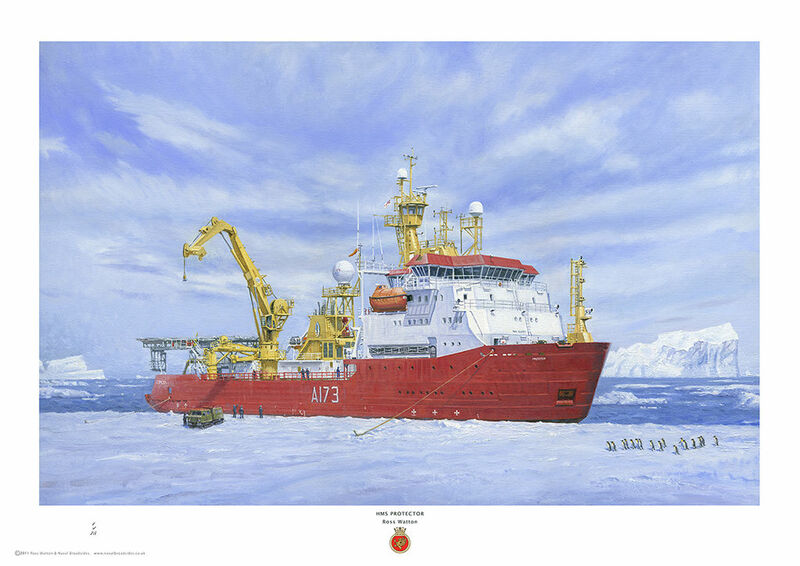 HMS Protector (A173) Antarctic Patrol Ship was leased for 3 years, from Norwegian company G C Reiber Shipping. Formerly known as MV Polarbjørn (Polar Bear). She was built in 2001, as an icebreaker, to undertake long duration Antarctic expeditions and offshore subsea support duties. She has been modified for service with the RN; this has involved citing the helicopter pad on the stern. Protector carries a Survey Motor Boat named the James Caird IV and 3 BV206 All Terrain Carriers. Commissioned into RN service on the 23 June 2011. Her length is 89.7m with a maximum speed of 14.5 knots and displacing 4,985 GRT. The painting was the official commissioning painting and is displayed on board.